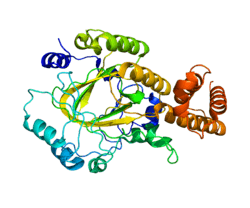 PHD finger protein 8 is a protein that in humans is encoded by the PHF8 gene. PHF8 belongs to the family of ferrous iron and 2-oxoglutarate dependent oxygenases, and is active as a histone lysine demethylase with selectivity for the di-and monomethyl states. Mutations in PHF8 cause Siderius type X-linked mental retardation (XLMR) (OMIM 300263). In addition to moderate intellectual disability, features of the Siderius-Hamel syndrome include facial dysmorphism, cleft lip and/or cleft palate, and in some cases microcephaly. A chromosomal microdeletion on Xp11.22 encompassing all of the PHF8 and FAM120C genes and a part of the WNK3 gene was reported in two brothers with autism spectrum disorder in addition to Siderius-type XLMR and cleft lip and palate. This catalytic activity is disrupted by clinically known mutations to PHF8, which were found to cluster in its catalytic JmjC domain. The F279S mutation of PHF8, found in 2 Finnish brothers with mild intellectual disability, facial dysmorphism and cleft lip/palate, was found to additionally prevent nuclear localisation of PHF8 overexpressed in human cells. The catalytic activity of PHF8 depends on molecular oxygen, a fact considered important with respect to reports on increased incidence of cleft lip/palate in mice that have been exposed to hypoxia during pregnancy. In humans, fetal cleft lip and other congenital abnormalities have also been linked to maternal hypoxia, as caused by e.g. maternal smoking, maternal alcohol abuse or maternal hypertension treatment. ↑ "Diseases that are genetically associated with PHF8 view/edit references on wikidata". ↑ "Drugs that physically interact with Histone lysine demethylase PHF8 view/edit references on wikidata". ↑ "Entrez Gene: PHF8 PHD finger protein 8". ↑ Loenarz C, Schofield CJ (Mar 2008). "Expanding chemical biology of 2-oxoglutarate oxygenases". Nature Chemical Biology. 4 (3): 152–6. doi:10.1038/nchembio0308-152. PMID 18277970. 1 2 3 Loenarz C, Ge W, Coleman ML, Rose NR, Cooper CD, Klose RJ, Ratcliffe PJ, Schofield CJ (Jan 2010). "PHF8, a gene associated with cleft lip/palate and mental retardation, encodes for an Nepsilon-dimethyl lysine demethylase". Human Molecular Genetics. 19 (2): 217–22. doi:10.1093/hmg/ddp480. PMID 19843542. ↑ Siderius LE, Hamel BC, van Bokhoven H, de Jager F, van den Helm B, Kremer H, Heineman-de Boer JA, Ropers HH, Mariman EC (Jul 1999). "X-linked mental retardation associated with cleft lip/palate maps to Xp11.3-q21.3". American Journal of Medical Genetics. 85 (3): 216–20. doi:10.1002/(SICI)1096-8628(19990730)85:3<216::AID-AJMG6>3.0.CO;2-X. PMID 10398231. ↑ "OMIM: Siderius X-linked mental retardation syndrome". Retrieved 2009-10-21. ↑ "OMIM: PHD finger protein 8; PHF8". Retrieved 2009-10-21. ↑ Abidi F, Miano M, Murray J, Schwartz C (Jul 2007). "A novel mutation in the PHF8 gene is associated with X-linked mental retardation with cleft lip/cleft palate". Clinical Genetics. 72 (1): 19–22. doi:10.1111/j.1399-0004.2007.00817.x. PMC 2570350 . PMID 17594395. ↑ Laumonnier F, Holbert S, Ronce N, Faravelli F, Lenzner S, Schwartz CE, Lespinasse J, Van Esch H, Lacombe D, Goizet C, Phan-Dinh Tuy F, van Bokhoven H, Fryns JP, Chelly J, Ropers HH, Moraine C, Hamel BC, Briault S (Oct 2005). "Mutations in PHF8 are associated with X linked mental retardation and cleft lip/cleft palate". Journal of Medical Genetics. 42 (10): 780–6. doi:10.1136/jmg.2004.029439. PMC 1735927 . PMID 16199551. 1 2 Koivisto AM, Ala-Mello S, Lemmelä S, Komu HA, Rautio J, Järvelä I (Aug 2007). "Screening of mutations in the PHF8 gene and identification of a novel mutation in a Finnish family with XLMR and cleft lip/cleft palate". Clinical Genetics. 72 (2): 145–9. doi:10.1111/j.1399-0004.2007.00836.x. PMID 17661819. ↑ Qiao Y, Liu X, Harvard C, Hildebrand MJ, Rajcan-Separovic E, Holden JJ, Lewis ME (Aug 2008). "Autism-associated familial microdeletion of Xp11.22". Clinical Genetics. 74 (2): 134–44. doi:10.1111/j.1399-0004.2008.01028.x. PMID 18498374. ↑ Millicovsky G, Johnston MC (Sep 1981). "Hyperoxia and hypoxia in pregnancy: simple experimental manipulation alters the incidence of cleft lip and palate in CL/Fr mice". Proceedings of the National Academy of Sciences of the United States of America. 78 (9): 5722–3. doi:10.1073/pnas.78.9.5722. PMC 348841 . PMID 6946511. ↑ Shi M, Wehby GL, Murray JC (Mar 2008). "Review on genetic variants and maternal smoking in the etiology of oral clefts and other birth defects". Birth Defects Research. Part C, Embryo Today. 84 (1): 16–29. doi:10.1002/bdrc.20117. PMC 2570345 . PMID 18383123. ↑ Hurst JA, Houlston RS, Roberts A, Gould SJ, Tingey WG (Oct 1995). "Transverse limb deficiency, facial clefting and hypoxic renal damage: an association with treatment of maternal hypertension?". Clinical Dysmorphology. 4 (4): 359–63. doi:10.1097/00019605-199510000-00013. PMID 8574428.